Heat a large non-stick skillet or a griddle over medium heat; swirl a pat of butter over bottom of pan. Pour batter onto the skillet in 1/4-cups portions onto the skillet, allowing for space between each pancake. Cook until edges are light golden brown and bubbles form on the top. 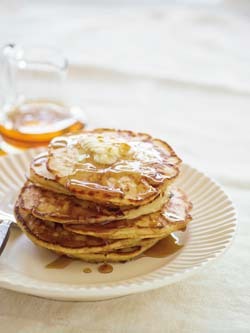 Turn pancakes over and cook until the bottoms are light golden brown. Pancakes should be crispy outside and creamy inside. Place cooked pancakes on platter in 200°F.-oven to keep warm while you cook remaining pancakes. Serve with butter and warm maple syrup or honey. Makes about 16 (4-inch) pancakes.